We followed them away from the party, down Kensington Place to a restaurant, where we sat winded and stunned by the news. Somehow we found something to laugh about; we always found something to laugh about. A few weeks later, Simon rang – we rang each other most days, to gossip, to analyse the Test Match, to disparage the work of other writers. A producer had been in touch with Simon’s agent (my agent too) to see if he would consider dramatising his book The Smoking Diaries. We decided to establish a routine. We would meet every afternoon in Simon’s house and write until he became too tired to concentrate buy generic xanax online (usually about three hours). This seemed to work well. We were both creatures of habit. I would leave my house, by Kensington Church Street, and walk down the hill to Holland Park. We met at Lidgate’s, where Simon introduced me to a hideously addictive honeycomb confection called Hokey-Pokey: bad for the weight, even worse for the teeth. I would sit in one of the swivel chairs while Simon crouched over the computer. Neither of us had collaborated like this before, and both, I think, found it the greatest fun once we conquered our initial shyness. There’s some- thing awfully intimate about writing a play – and it was odd (to say the least) discussing Simon’s approaching death as material for a stage entertainment. SIMON: Now look – the scene where I get the news of the tumour – should that be the end of Act One or the beginning of Act Two? What do you think? HUGH: End of Act One, surely? Terrific end to Act One. SIMON: Good for bar trade, anyway. They’ll all need a drink after that. And so we’d laugh, Simon spluttering and reaching for another Silk Cut. Simon lived to an idiosyncratic timetable: bed at dawn, rising at noon, which meant that when I started work at nine-ish (in the morning) there would be a sheaf of overnight emails from Simon, full of spontaneous wit and observation and penetrating self-examination. Simon wrote like a great jazz musician plays – a cascade of improvisatory riffs – rhythmic, daring, utterly unique. When our first draft was finished, we both felt bereft. The afternoons were strangely empty. We had dinner with the producer and discussed who might direct the play. A name was mentioned. ‘He’s not free until November,’ said the producer. ‘Too late!’ said Simon, exploding with laughter. Alas, it was too late. He died, not of cancer, but an aneurysm. The joy and privilege of working with him will stay with me for the rest of my days – those February afternoons – so challenging, exhilarating and, above all, so tremendously full of life. 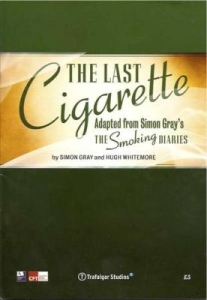 The Last Cigarette(with Hugh Whitemore) was published by Faber and Faber in 2009. To order a copy on special offer at 25% discount, go to the Faber website and use the code GRAYPLAYS. Or check out the plays section of our bookshop.